Assessment Reports consist of contributions from each Working Group and a Synthesis Report integrating these contributions and any Special Reports prepared in that assessment cycle. The IPCC also produces Special Reports on specific issues agreed by its member governments, and Methodology Reports that provide practical guidelines for the preparation of greenhouse gas inventories. The IPCC prepares comprehensive Assessment Reports about the state of scientific, technical and socio-economic knowledge on climate change, its impacts and future risks, and options for reducing the rate at which climate change is taking place. The IPCC also produces Special Reports on specific topics agreed by its member governments, as well as Methodology Reports that provide practical guidelines for the preparation of greenhouse gas inventories. The Synthesis Report integrates the Assessment Report and any Special Reports prepared during an assessment cycle. Learn more about reports here. A report consists of a number of chapters. It may also include a Technical Summary, prepared by the authors. Assessment Reports, Special Reports and the Synthesis Report include a Summary for Policymakers that is prepared by the authors and approved line by line by a Plenary Session of the IPCC with the delegates in dialogue with the authors. Since the Fifth Assessment Report, the Summary for Policymakers has generally included headline statements, providing a top-level summary and narrative of the key findings. Methodology Reports include an Overview Chapter corresponding to the Summary for Policymakers. Reports may include Supplementary Material such as Frequently Asked Questions. Each and every review comment is considered by the authors in the preparation of a Second Order Draft of the report. At the same time, the authors also prepare a first draft of the Summary for Policymakers This is a distillation of the main policy-relevant findings from the underlying report. 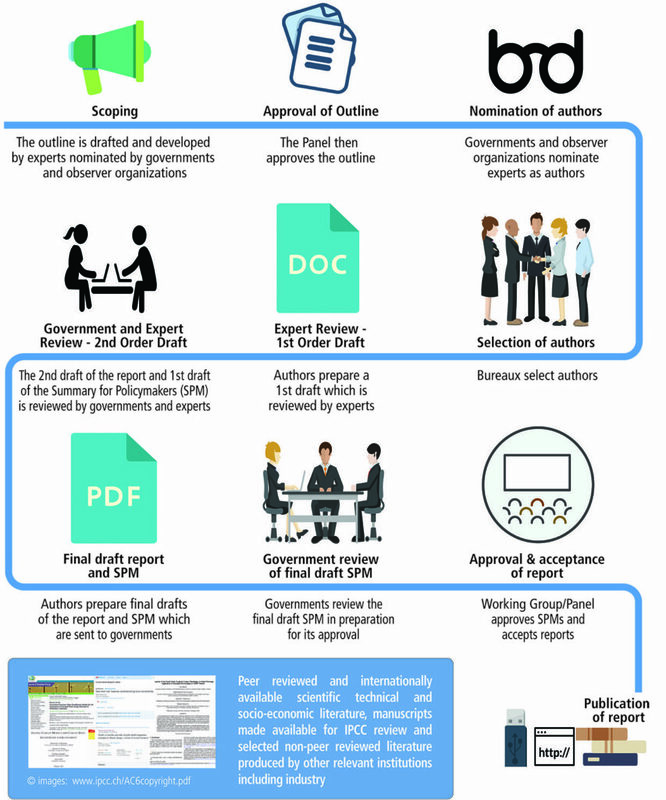 The Second Order Draft of the report and the first draft of the SPM are then opened up to a second stage of review by experts and governments, simultaneously.